BANGKOK—The demolition of about 100 homes near Ho Chi Minh City, including one owned by the Catholic Church, has pitted the church against authorities in the latest such dispute over land in the Communist Party-ruled country. Residents in Tan Binh district received no warning of the demolitions earlier this month and were given little compensation, according to local media reports. Land conflicts have risen in Vietnam since the ruling Communist Party launched its economic reforms, or doi moi, in the late 1980s, which resulted in more farming land being taken over to build highways and large industrial zones. Disputes over property between Catholics and authorities are common, and have posed one of the key obstacles to a normalisation of relations with the Vatican. Historically, the party-state has distrusted the Catholic Church because of its close connection to the French colonial government, said John Gillespie, director of the Asia-Pacific Business Regulation Group at Monash University in Melbourne. Church land was taken over by the state after 1954 in the North, although some of the land was returned during the 1980s and 1990s when the government relaxed its opposition to organised religion, he told the Thomson Reuters Foundation. Current disputes often occur when former church land is redeveloped by the private sector, he said on Thursday. Vietnam has the most number of Catholics in Southeast Asia after the Philippines. In several incidents, churches and monasteries in Hanoi, Hue and Saigon have been attacked and come under pressure to accept demolition and the expropriation of their land, according to a report published Wednesday by Christian group Open Doors. Local authorities cited by state-run Tuoi Tre newspaper said the homes in Tan Binh district were built illegally on public land. The incident reflected a pattern of behaviour of the government towards church land in the country, said Vincent Long Van Nguyen, a Vietnamese-born bishop in Australia. Authorities often resort to the use of force to seize such properties and land in places which have potential commercial value, Nguyen said in a statement posted last week on the website of the diocese of Parramatta near Sydney. The latest land grabbing exercise has caused extensive damage, destruction and hurt to hundreds of families. Many have been left homeless, their livelihoods ruined and their lives irreparably damaged, he said. Authorities in Tan Binh district were not available for comment. Last year, Catholic nuns were beaten in a protest over disputed land, while in 2017 violence erupted over land belonging to the Thien An Saint Benedict Monastery in Hue, about 700 km (435 miles) southeast of the capital Hanoi. 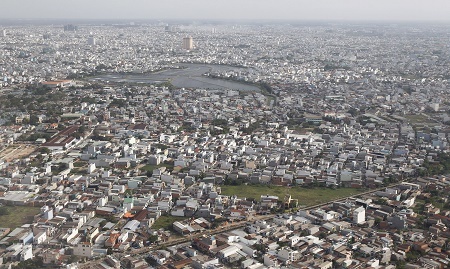 Photo: An aerial view of Ho Chi Minh City, 2 March 2012. Source: Kham/REUTERS.